The head of the federal government’s immigration enforcement agency for virtually all of President Trump’s term is retiring, despite Trump having nominated him to serve in the position on a permanent basis. Thomas Homan, originally the acting director of Immigration and Customs Enforcement before a vacancies law forced the agency to change his title to senior officer performing the duties of director, was a passionate advocate for Trump’s immigration policies and helped implement many of the president’s signature issues. ICE arrests increased 42 percent in Trump’s first year, and the ratio of deportations resulting from ICE arrests grew by 11 points to 37 percent. Overall ICE removals were down 6 percent in Trump’s first year, however, as more deportations occurred at the border and immigration courts increasingly became flooded with backlogs. “It has been the honor of my life to lead the men and women of ICE for more than a year,” Homan said in a statement. “The decision to leave federal service after more than 34 years is bittersweet, but my family has sacrificed a lot in order for me to serve and it’s time for me to focus on them.” Holman received a Presidential Rank Award in 2015 for distinguished service. “I am humbled and inspired by the 20,000 American patriots who serve this agency and protect our nation, increasingly in the face of unfair and false criticism from politicians and the media,” Homan said in his statement Monday. 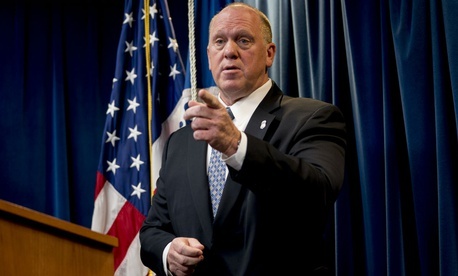 Homan was originally scheduled to retire in January 2017, according to an ICE official, but stayed on at the request of then-Homeland Security Department Secretary John Kelly. He had planned to stay on only until Trump nominated a permanent director, but the president instead tapped Homan. His nomination has yet to receive a vote in the Senate, and Homan has informed DHS leadership he plans to retire over the summer. Secretary Kristjen Nielsen asked Homan to remain in his position to “assist with transition planning,” the ICE official said. While Homan was largely successful in helping Trump realize one of his marquee campaign promises, he struggled to bring in the massive influx of employees the president demanded in his first weeks in office. Trump called on ICE to hire 10,000 new agents, but in 2017 its deportation officer onboarding dropped in half to just 371. ICE was able to reduce its average hiring time by 23 percent in 2017. The agency is currently soliciting vendors for a contract to help it hire 8,500 deportation officers, 1,500 criminal investigators and 6,600 support staff. An ICE official said the transition process is ongoing and it had no further personnel announcements at this time. Homan is the second top agency nominee to withdraw from consideration in as many weeks. Rear Adm. Ronny Jackson, Trump's selection to head the Veterans Affairs Department, withdrew his nomination for that post last week.